I propose, for the first time in France, this magnificent box set of the trilogy hellraiser in HD already sold out, limited to 200 copies! It is for pre-order and will be shipped in the month of October normally. This box is unique, nine of course and will be delivered with. 1 box digipack 3 trays 4 blu-ray in a hard case. 1 hellraiser book of 152 pages written by marc toullec. Including the original novel by clive barker, to know everything about the origins of this universe! 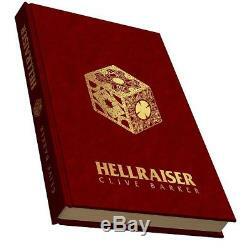 The book hellraiser in a semi-format edition with a binding old type blood red leather, including, in addition to the novel of the master of the horror clive barker, a preface by benoit domis the great specialist of the genre and an unpublished interview between clive barker and peter atkins, screenwriter of the hellraiser movies. Preface by benoît domis (horror specialist). The hellraiser novel of clive barker. An unpublished interview between clive barker and peter atkins, scriptwriter of hellraiser films. 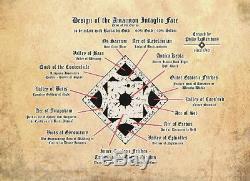 The characteristics of the book. A semi-sized book: internal block size 130 x 200 mm. Pagination: 192 pages (estimate) French printing. Cover: hardcover leatherette (old red blood). With hot gold on the cover. And vertical headband on the back. 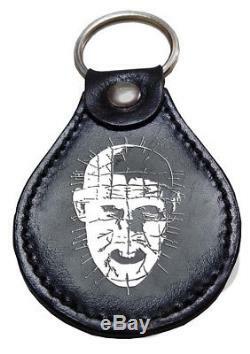 Black pinhead leather keychain, allowing you to take this iconic entity anywhere with you. The illustrated shots of the hellraiser cube, giving you access to all the secrets to penetrate this world of torture and its pleasures .... it's about several collector cards (see photos), detailing the hellraiser cube! A pinhead bust resin (height about 25cm) that can also receive your digipack in a base. The 3 hellraiser films will benefit from new high definition masters. Original versions subtitled 5.1 (and stereo for hellraiser 3). French versions 2.0 stereo (and 2.0 mono for hellraiser 2). In addition, hellraiser 3 will benefit from a director's cut version in addition to the movie version! To take you further into the world of torture and its pleasures, the supplements of this collector's edition will be distributed on the 3 blu-ray of each film and on a bonus blu-ray. Numerous programs will be proposed and will constitute several bonus hours (currently being finalized). Interviews, Leviathan documentaries, audio commentaries. The item "box set blu-ray collector hellraiser (preco) + bust resin limited to 200 ex" is on sale since Monday, September 3, 2018. It is in the category "dvd, cinema \ dvd, blu-ray". The seller is "kurtc1996" and is located in / in nord-pas-de-calais. This item can be shipped to the following country: France.